Sometimes you may be in need of a particular file and luckily you find it over the web but unfortunately it is zipped along with a bunch of other files and the download link is a huge zip file. Now just for the sake of one file you download the whole zip archive even though you don’t want the rest of the files. Well, you don’t really need to download the whole thing. You can download selected file(s) with the help of WebZip. WebZip is a tiny utility for Windows. It generates the list of files within a zip folder. All you need to do is just paste the link of the ZIP file in the ‘Web path’ box and click on ‘Get’. 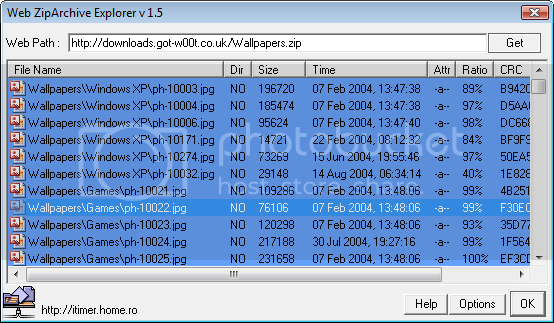 It will take a few seconds to look into the file and then generate the list of files. You can then select the files you want to download and then right click and select ‘Extract’. You’ll be prompted to select a save location. Select a save location for the file and the download will start. Pretty easy isn’t it?